This recipe was a combination of a couple different recipes I found on Pinterest. As I always do, I tweaked them a bit to match our family's tastes, likes and needs. I've recently needed to remove dairy from my diet. It's been a difficult, but totally rewarding experience. The difficult part is learning to adjust to new products and how to adjust well-loved recipes to accommodate my new dietary lifestyle. The rewarding part has been feeling SO much better everyday & losing some weight (always good!). I was craving a lemony, Spring-time, pasta dish yesterday. This recipe is lemony, silky, and perfect for spring! Earlier, prepare 1 recipe of CrockPot Prepped Chicken with lemon-pepper seasoning. Cut chicken into chunks. Set aside. Melt 2 tablespoons of the vegan butter spread in a medium pan over medium heat. Add the onion and cook, stirring often, until the onion is translucent but not browned, about 3 minutes. Add garlic. Cook for about 30 seconds. Add the wine/chicken broth and lemon juice and bring to a boil over high heat. Cook until the liquid is reduced by two-thirds, about 5 minutes. Prepare pasta according to package directions. Cook broccoli florets in the same pot as the pasta. Reduce the heat to its very lowest setting. Slowly whisk in butter, one piece at a time, letting the first addition melt before adding more butter, until sauce is thickened & silky. (The amount of butter will vary.) Season with salt and pepper, if desired. If you've prepped the chicken on another day & you need to heat it, add it to the sauce during the last few minutes and allow the chicken to heat through. Place cooked pasta and broccoli on platter or in a pasta bowl. Top with chicken and spoon sauce over chicken and pasta. If desired: squeeze the juice of a fresh lemon over the dish & sprinkle with freshly-chopped italian parsley. This is a new product for me - and I LOVE it! If you're making this recipe non-dairy/vegan, you'll need a product like this. The important part (besides being lactose free, vegan, etc) is the 78% vegetable oil. You need the high fat content to get the silky feel of butter and to achieve that same silkiness in your sauce. I've posted before about having pre-cooked, cubed chicken on-hand for those nights when you don't have a lot of time & need chicken for a stir-fry or casserole. I've tried a few different ways of prepping chicken - poaching it, roasting it, even grilling it... But this method is BY FAR my favorite! Just pop them in after lunch & they're ready for dinner. Prepping your chicken in the crock pot is not only super simple, it's moist, flavorful & super delish! You can use any flavor of spices - the basic recipe stays the same. Try lemon-pepper, garlic, Italian, Mexican, Cajun, regular seasoned salt (like Emeril's Essence or Lawry's), or just plain salt & pepper (not all together, obviously). Whatever will match the meal you have planned. I like using the salt-free spice mixes best. They keep your sodium intake down & still gives you lots of flavor. Hand-trim fat & unwanted parts from your chicken breasts/thighs & discard the unwanted portions. Cut the trimmed breasts in half horizontally (not length-wise). You can decide if you want to half the thighs - you want the pieces to be just smaller than your palm. Place them in a single layer in the CrockPot. Cover & cook on LOW about 5 hours, or until chicken is cooked through & broth is almost totally gone. Serve as whole pieces or cut into chunks to save for future recipes. ** I've added aromatics too - like sliced lemons, garlic cloves, or herbs to match the spices I've chosen, but these aren't necessary. If you decide to use them, just lay them on top of the chicken after you've sprinkled the spices. I clipped the original recipe for this dinner from a magazine years ago. I can't even remember which one! I've hung onto it for awhile but haven't ever made it - BIG mistake. I decided to make a few adjustments to fit our family's tastes and the final result was perfect! Creamy, lemony, slightly cheesy & bacon-y - everything a pasta dinner should be. Cook bacon until crispy, crumble & set aside. Save leftover bacon grease in skillet (you'll heat up the cooked chicken in this skillet). In a small bowl, whisk together ricotta, lemon juice, lemon zest, Parmesan, parsley, olive oil, salt & pepper. Set aside. Add penne to boiling water & cook for about 7 minutes or until tender. Add broccoli to pot for the final 3 minutes of cooking time. While penne is cooking, heat the same skillet you used for the bacon to medium-medium high. Add cooked, cubed chicken. Stir to coat with bacon grease. Leave in skillet until warmed thoroughly, stirring occasionally. When penne & broccoli are done, reserve 1 cup pasta water. Set aside. Drain pasta/broccoli & place in large serving bowl. Add ricotta mixture to serving bowl with pasta/broccoli. Stir well. Add heated chicken & crumbled bacon to serving bowl. Stir well to combine. Add reserved pasta water by 1/4 cupful if necessary (to increase the creaminess of the cheese mixture - you may not need any pasta water at all). We served this with garlic bread. I had a few inspirations that drove the creation of this recipe. First, we have a local restaurant that we love, but can't always afford - isn't that always how life goes?! It's called Rumbi Island Grill. 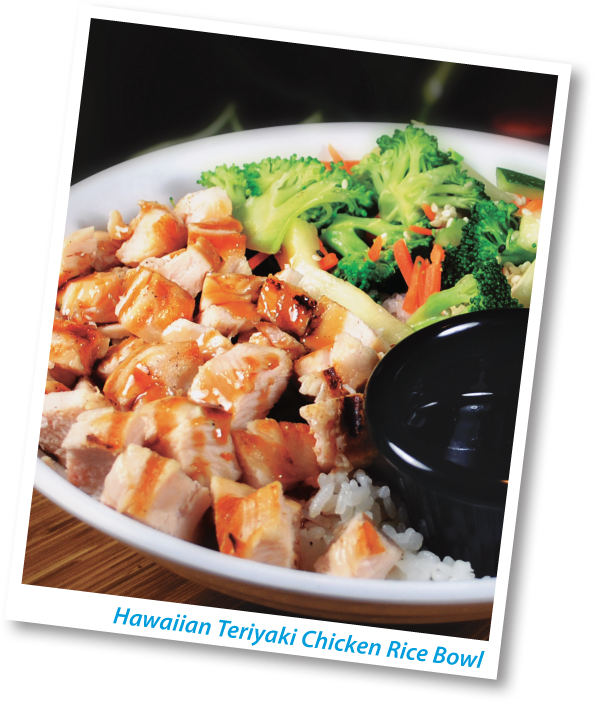 One of our favorites is their chicken rice bowls. Second inspiration - During the hot summertime, I love to serve meals that are light, fresh, and don't heat up my kitchen too much during preparation. Third, I always like to find ways to re-create our favorite meals at home for much less money. SO - This meal uses a slow cooker for the chicken and you whip up the veggies and rice just before serving -probably 15 minutes cooking, tops! Plus, if I'm shopping sales, I can make this meal for about $12 for my family of 6 adults and teens. And it feeds our Rumbi cravings too - It's perfect. I found the recipe for the chicken portion of this meal on Pinterest. The link (http://www.sixsistersstuff.com/2012/07/slow-cooker-garlic-and-brown-sugar.html) took me to Six Sisters' Stuff - LOVE their blog! The chicken recipe immediately reminded me of Rumbi - YAY! - When my family started making the yummy noises, I knew I had a winner. Mix together brown sugar, vinegar, soda, garlic, soy sauce, and pepper. Pour over chicken in slow cooker. Cook on low for 6-8 hours or high for 4-5 hours, if using frozen chicken. For thawed chicken, cook on low 5-6 hours, on high for about 4 hours. Take chicken pieces out of slow cooker and lightly shred in a bowl. Set aside. Pour remaining sauce from slow cooker into saucepan. Place saucepan over high heat. Mix together corn starch and water, pour into saucepan, and mix well. Let sauce come to a boil and boil for 2-3 minutes, or until it starts to thicken and turns into a glaze. You'll need to watch the sauce and whisk it occasionally. Remove from heat and let sit for a minute or two (it will continue to thicken as it cools down). ** Mix together the quantities noted in the ingredients list of brown sugar, vinegar, soda, garlic, soy sauce, and pepper. Pour into saucepan. Follow the sauce directions above. We like to serve this buffet-style, but you could build the rice bowls before bringing them to the table. Rice in first, followed by veggies, top with shredded chicken & drizzle with sauce. Oh my goodness, these are yummy!! Leftovers keep well for a day or two, but I doubt you'll have any. Cream shortening and sugar. Add well beaten eggs. In a separate bowl, combine flour, salt and soda. In a blender add bananas and blend until they are liquified. Alternately add the flour mixture and the bananas to the creamed mixture. Pour the batter into 4 small loaf pans or 2 larger pans. Bake at 300 degrees for 25 minutes approximately for smaller loaf pans, and 50 minutes for larger loaf pans. These were SOOO good!! Best of all - this meal requires very little effort (your slow cooker does most of the work) and yields an awesome result! A few minutes in the morning and about 10 minutes right before dinner is all you'll need. Just add a green salad & you're good to go. Enjoy! Turn slow cooker on LOW. Pour in 1 can beef broth. Place roast in slow cooker. Sprinkle 1/2 Italian salad dressing seasoning packet over roast. Tumble sliced onions over top of roast. Mix remaining Italian salad dressing seasonings with remaining 1/2 can beef broth and pour over roast & onions. Cook on LOW 6-8 hours or on HIGH 4-5 hours. Remove meat & onions from slow cooker to a medium-size bowl. If you don't like the onions, you can throw them away. I like to keep them in a separate bowl & top the sandwiches with them. (Well, my sandwich since the family doesn't like cooked onions - lol!) Set aside. Pour liquid in crock pot through a sieve into at least a 4 cup glass measuring cup (preferrably one that pours the broth from the bottom & leaves the oils on top behind in the measuring cup). Discard contents of sieve. Pour 1 1/2 cups broth back into crock pot. Discard excess liquid & oils. Shred meat with forks & return to slow cooker with broth. Stir in parmesan cheese until all cheese & liquid is combined with the meat. Place bottom halves of rolls on a foil-covered baking sheet. Distribute meat/cheese mixture evenly between all 12 rolls. Top each with 1 slice provolone cheese. Place under broiler until cheese is melted & lightly browned (just 1-2 minutes). Top with top halves of rolls. Serve immediately. Only use 1 can beef broth in bottom of slow cooker. Top seasoned roast with roasted peppers & sliced onions. Mix remaining Italian salad dressing seasonings with roasted peppers liquid from the jar. Pour liquid/seasonings mixture over roast/peppers/onions. Reserve peppers & onions from sieve. Top meat/cheese mixture with peppers & onions before topping with provolone cheese - OR - stir peppers & onions into shredded meat along with parmesan cheese. Continue with recipe as noted above. This recipe was inspired by this one at kraftrecipes.com. Do you like monkey bread? We do - A LOT! Normally, it's full of buttery cinnamony-sugary goodness and absolutely delicious! What do you think of monkey bread smothered with cheese & dotted with bits of bacon and green onion?? We weren't sure what to think, but after making this recipe last night - we can say we think it's YUMMM!! We paired this with our favorite cheesy bratwursts & chicken/apple sausages and a big green salad. Preheat oven to 350*F. Lightly grease/spray with cooking spray a 9" deep pie pan. Layer half each of the dough pieces & cheese in prepared pie plate. Sprinkle with half the cooked/crumbled bacon. Bake 25-30 mins or until golden brown. Top with remaining cheese. Bake 3 mins or until cheese is melted. Transfer to a serving plate/platter (or a small cutting board) to serve. Sprinkle with green onions before serving. NOTE: It's easier to cut pieces (like a pie) & serve them than to pull this apart. But if you want to pull it apart, go for it. Just know - it's messy! We will definitely follow the directions correctly next time. We sprinkled the onions between the layers and on top before baking. The crisp of the cool green onions on top would've been much better than cooking them inside. I also think the rolls would've browned better if they didn't have the cheese & onions on top before baking (the original directions called for them to added afterwards or at the end). Another change request from my kids - more bacon! I'll probably double the amount next time. I think a dipping sauce or drizzle would be good too. There are variations for Mexican-style, Italian-style, and Caramelized Onion-Rosemary monkey breads on kraftrecipes.com - be sure to check those out too. They sound yummy! How can you go wrong with chicken, lightly floured & browned, simmered in a creamy lemon-garlic sauce, and poured over whole grain pasta & fresh-steamed broccoli?!? It's dreamy-delicious! Have you seen these? They come in all kinds of flavors (tomato, cheese, creamy basil, etc). I know some people aren't into processed foods, especially sauces. But I was pleased with the low carb count (for my Type 1 diabetic son) and the quick-and-easy part really appealed to me. I think from-scratch is always best, but you can't beat these in a pinch! And it was FREE. Double-good. I found Creamy Lemon Chicken, made a couple of small adjustments, and it became my Creamy Lemon-Garlic Chicken. Hope you like it! 1. Mix flour, salt & pepper together in a medium-sized bowl. In a large skillet, preheat 2 Tblsp vegetable oil over medium-high heat. 3. In a small bowl, mix cooking sauce & lemon juice. Place all the cooked chicken breasts back into the skillet, turn heat to medium-low. Pour sauce/lemon juice mixture over the chicken. Simmer 5-10 minutes or until jice of chicken is clear when center of thickestpart is cut (at least 165*F). 4. While chicken & sauce are simmering, cook broccoli florets & pasta together in a large pot of boiling water, according to pasta package directions. 5. Drain pasta & broccoli well. Pour onto large serving platter or into large serving bowl. Pour chicken & sauce over the top. NOTE: You don't have to buy thin-cut boneless skinless chicken breasts, but it sure makes this recipe go faster & easier!! If you have regular chicken breasts, place each chicken breast, smooth side down, between pieces of plastic wrap or waxed paper. Gently pound with flat side of meat mallet or rolling pin until about 1/2 inch thick. Follow recipe as directed above. BettyCrocker.com recommended this be served over rice. I liked the idea of pasta better, but if you're into the rice - go for it! You can't go wrong here - brownies, chocolate chips, fun paper wrappers, chocolatey deliciousness in every bite - it's a winner all around! I've had the best luck with Pillsbury brownie mix or a store-brand mix, interestingly. The other brands I've tried just haven't come out as well. I also use the high altitude recipe. Firstly, because I need to - I live at 3800 ft. Secondly, because they need the extra flour for texture. Try it both ways, but I think you'll come back to the high altitude recipe too. Mix brownie batter as directed on box. Fill each cup just over half-full of brownie batter. Bake for about 22 minutes or until a knife inserted in center comes out clean. Allow to cool for 2-3 minutes in pans. Transfer to a cooling rack. I didn't get a picture of it, but these are SO cute on a plate with a small scoop of ice cream on top! Top with your favorite toppings - sprinkles, syrups, nuts, etc. When we moved to Utah from California, I was devastated when most of my baking recipes didn't turn out right - especially my breads! It took me a bit to figure out the high altitude challenges, make the adjustments & get back to baking zucchini, banana & pumpkin breads again. 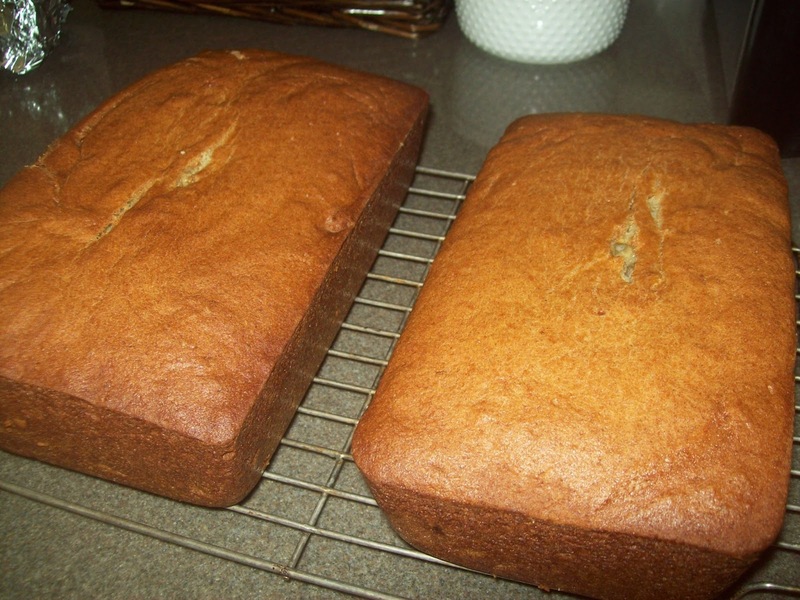 This recipe has been my most-successful for zucchini bread. I made 5 loaves yesterday from ONE zucchini my neighbor brought over - wow! One and one-half of the loaves are already gone. Happy, happy family! I especially like that the outside crust gets slightly crisp. You can substitute mini-chocolate chips for the raisins in this recipe if you're like me & don't like raisins! Preheat oven to 350*F. Grease 2 9x5x3" loaf pans. In a large mixing bowl, blend eggs, sugars, oil & vanilla. Add zucchini. Mix well. Combine dry ingredients with liquid mixture. Mix just until moistened. Add walnuts & raisins, stirring only until blended. Bake about 50-60mins (depending upon your oven), or until a toothpick inserted in center comes out clean. Cool in pans for 10-15 mins, then remove loaves to a cooling rack. These loaves freeze really well! Make a few, wrap extras in wax paper & place in ziplock bag. They defrost moist & delicious, but without the slight crisp on the crust. They keep well up to 3 months. You can substitute mini-chocolate chips or the raisins, if you like. 4 boneless skinless chicken breasts - pounded to 1/2 inch thickness. Place spinach in a large glass bowl and heat in the microwave for 3 minutes, stirring every minute or so, or until wilted. Stir in the sour cream, pepper jack cheese, and garlic. Lay chicken breasts out on a clean surface, and spoon some of the spinach mixture onto each one. Sprinkle with pepper. 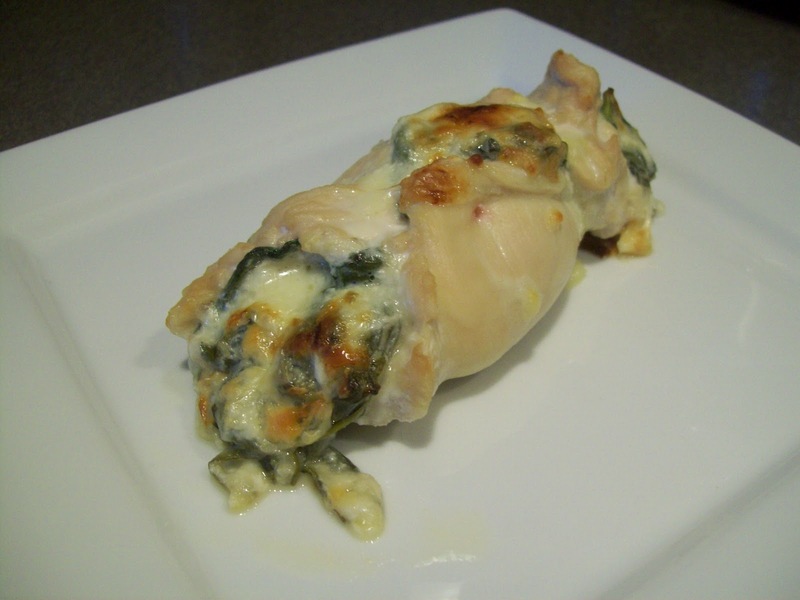 Roll up the chicken to enclose the spinach, then wrap each chicken breast with two slices of bacon. Secure with a toothpick or 2 and place in a 9x13 baking dish. Bake uncovered for 35 minutes, then increase the heat to 500 degrees and cook for an additional 5-10 minutes to brown the bacon. Press the pkg of crescent rolls into the botton of a 9x13 baking dish. Bake at 350 degrees for about 10 minutes or until lightly golden brown. Let cool. In a small bowl, combine the cream cheese and ranch packet. Stir until it is all mixed in well. Spread this over top of the cooked and cooled crescent rolls. Chop your vegetables up into small pieces. Put them all into a bowl to mix them together well. If you are adding chicken, do so at this point too, so it is all evenly mixed together. Pour this vegetable mixture over top of the cream cheese. 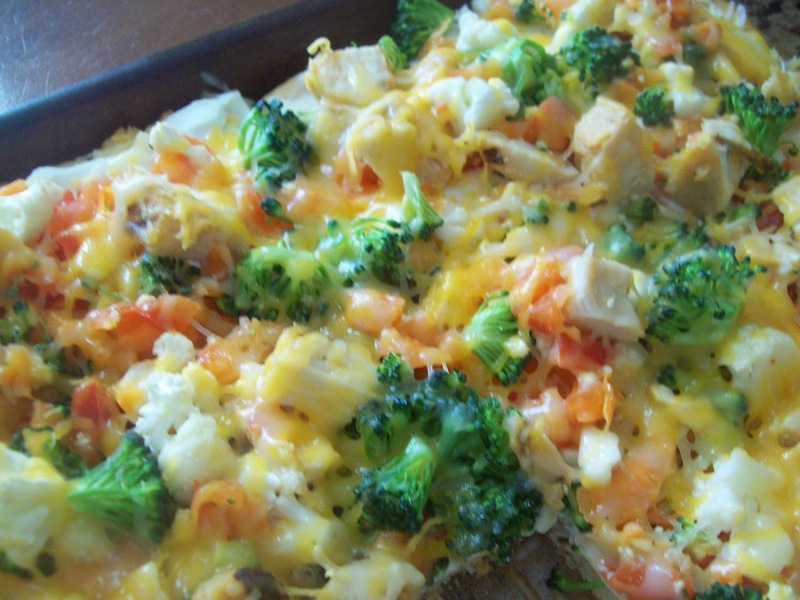 You can then serve immediately just like this, OR I added about 1/2 cup of grated cheddar cheese that was evenly distributed over top of the vegetables, and then I baked it in a 350 degree oven for 5 minutes. I only did this because I thought it would help keep it all together better. It really was DELISH. Enjoy. Doesn't this look YUMMMMY?!? It literally took 5 minutes to make, 40 minutes to bake & about 10 seconds to drizzle. Then I ran it over to a neighbor as a thank you gift. My kids were not happy it wasn't staying home. Butter the inside of a standard loaf pan. Place the cinnamon rolls, one by one, in the dish vertically (standing on their side). Overlap the rolls slightly at the middle and continue until the loaf pan is filled. Serve warm or let cool and enjoy later. This is a quick-n-easy upgrade for your favorite brownie recipe. To be totally honest, I'm a brownies-from-a-box kinda girl. Not that I can't make from-scratch brownies! But usually, I'm wanting a treat in a hurry & the box is only $1 minus my coupon & I just don't have the patience... Sound familiar? Anyway - quick & easy, delicious, ooey AND gooey! YUMMM!! NOTE: I would recommend lining your pan with non-stick foil or buttered parchment paper so the marshmallows don't stick to the pan. I didn't remember this step in the photos. I regretted it. Bake your favorite recipe for brownies. Put pan back in oven for 5-10 minutes or until the marshmallows have puffed up & turned golden brown. Allow to cool slightly, cut & serve. NOTE: These are hard to cut! Use a heated, sharp knife (heat by holding the blade under hot running water) and wipe the blade between cuts. Pretty much plan on losing your first one... but you can eat it to save everyone else from the pitiful crumbliness of it. You're a giver, right? ALSO...go check out this link for another variation that looks like it would be good too. Lettuce to wrap your burger in or you can use hamburger buns. Place the ground turkey into a medium sized bowl with dip mix and salsa. Mix until well combined. The mixture should be pretty moist. Form into 8 equal sized patties. Place 4 of the patties on the foil lined baking sheet and place the cheese in the middle of the patty. Then place the other patty over top of that and seal the sides together. Bake in oven for 30 minutes. Turn the burgers over and bake for an additional 5 minutes. Top the burger with salsa and wrap in a lettuce leaf. Dinner Time Ideas ~ Janis and Kathryn's Just for fun Blog! This is a blog that was started because of an idea from my friend Kathryn, who, like all of us struggle to find something different to cook for dinner. We are always looking for that yummy recipe that all the family will enjoy. Check our new coupon gallery at the bottom of the page. You will love it! You can just click on the coupons you want and then print them all together. It also has a COUPON CODE section so you can find your favorite retailer and look for deals at those locations too.